It’s a zillion times cheaper than ordering out! But seriously, I buy the crust mix (Just add water!) and a can of pizza sauce for less than a dollar each at the grocery store. You must buy the canned pizza sauce, not the jar, in order to maximize savings. On the pizza you can add whatever toppings you want. Just follow the directions on the package of pizza crust mix. My kids love pizza but ordering delivery can get expensive. Homemade is a good alternative. 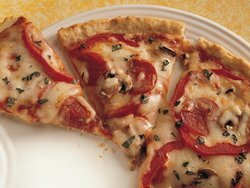 Betty Crocker also has a great recipe for easy pizza. Click on the picture to the right and view that one if you want to print it out. And kudos to Betty for such a lovely pizza photo! My food pics are sadly lacking, I know. Still, Betty didn’t tell you the cans-are-cheaper-than-jars trick. You heard it here first, folks!! Wow, thanks for the offer, but I’m good. I’ve got enough girls.